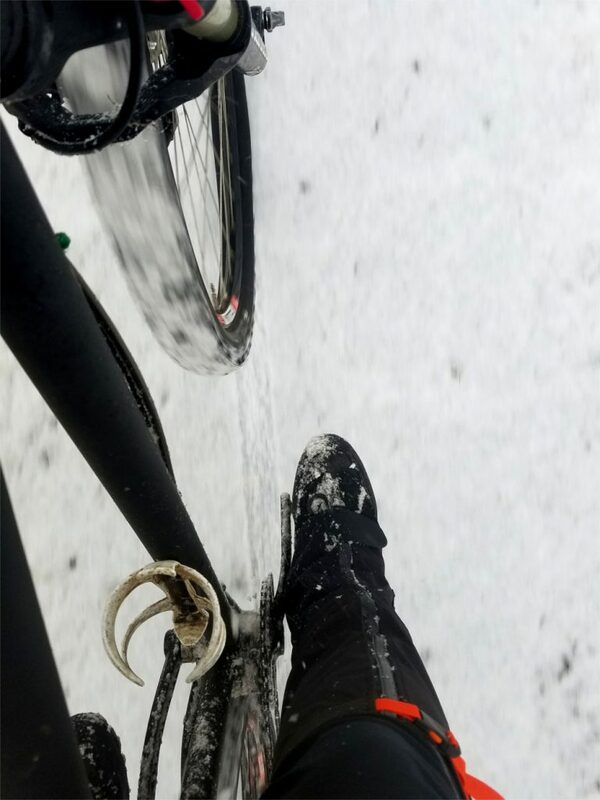 Cold, snow, sleet and ice are normal conditions for my winter bike commute to work here in Minnesota. With the elements being so inhospitable at times, I am excited to try any new product that offers warmth. With that concept in mind, I was excited to try the Hillsound Armadillo LT gaiter’s. For those of you who aren’t familiar with what a pair of gaiter’s does, they covers your shin and calf below the knee and above the ankle. It works in combination with your winter boots to extend a splash-proof protection up your leg. Basically, they are designed to keep snow, slush and debris off your legs and dripping down into your boot. Wearing the Hillsound Armadillo LT Gaiter for the first time. 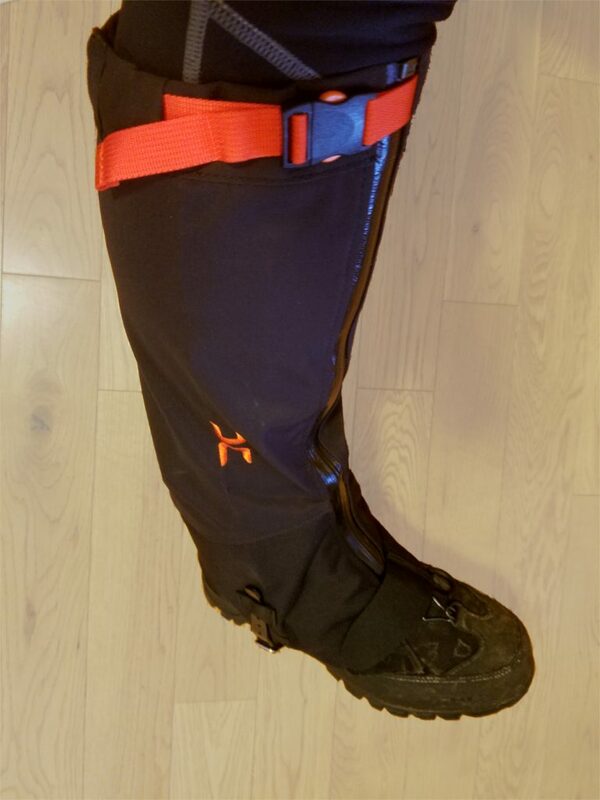 The Armadillo LT gaiter’s upper is constructed out of Flexia, a three layer material designed to stretch, be waterproof, and conform to your leg and stay in place. The lower section is made out of a dense nylon that appears to be extremely tough. The zippers are waterproof and the straps and clips seem to be more than tough enough for their job. Even though these gaiters exude durability, they are remarkably lightweight. High quality buckles, zippers and straps are standard. I have to admit that I have never tried riding with a gaiter before. Whereas my point of reference is small, I do spend a lot of time on my bike in the cold. For the frigid weather, my riding boot of choice is the 45NRTH Wölvhammer which is built with gaiters in mind. The Hillsound Armadillo LT gaiter paired with them easily. Thanks to the full-length zipper, I was able to get my riding gear and boots on, then fashion the gaiter into place with relative ease. That ease comes from the stretch that the upper material offers, as well as the easily adjustable lower Velcro strap and upper buckle strap. The addition of a waterproof layer was immediately apparent when I left my house. We had gotten a fresh coating of wet snow overnight and the salt trucks were out in force. Thanks to the slush created, my legs were immediately doused in slop but stayed dry and warm. This is a far cry from a week prior when I rode home without the benefit of gaiters. This time, I buzzed along through my normal route to work and noticed that my legs were noticeably warmer than usual. Also, when looking down at my legs (not something I recommend), I saw all the sludge my tires were kicking up bounce off the gaiters. By the time I reached the office, my legs were dry and comfortable, and the gaiter was still doing a good job repelling moisture. Snow and slush are no match for the Hillsound Armadillo LT Gaiter. With my first foray into gaiters I want to see where they are best used. I know that hiker and snowshoeing fans love them for their warmth and protection, now after trying them I am fascinated to see how they will help a cycling perspective. As of right now, I will definitely be reaching for them whenever the weather is both cold and wet. While I am sold on their benefit for wet conditions, I am looking forward to their added against wind chill when things get really cold. Stay tuned for more information on my adventures with the Hillsound Armadillo LT gaiter. 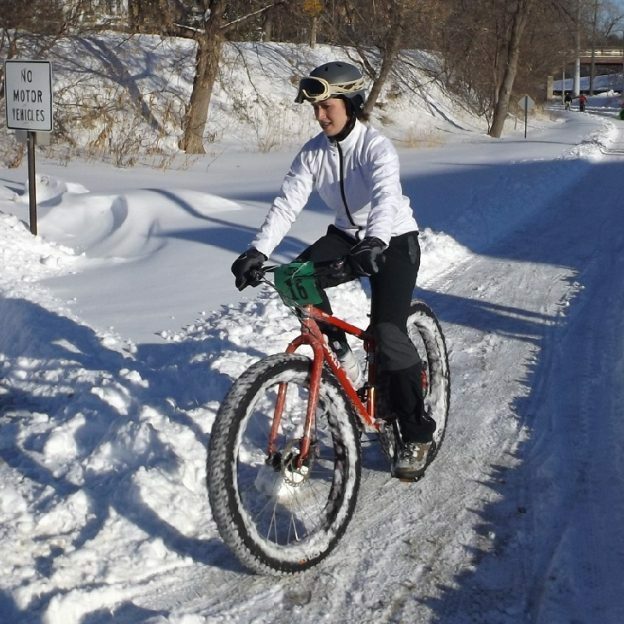 This entry was posted in News and tagged biking with gaitor's, fat bike, fat biking, Hillsound Armadillo LT gaiter's, ice biking, ice riding, leggings for winter biking, Riding in snow, Snow bike, snow biking, snow riding, staying warm fat biking, warm fat biking, winter biking clothing, winter fat biking, winter riding, winter riding clothing on December 16, 2017 by John Brown.